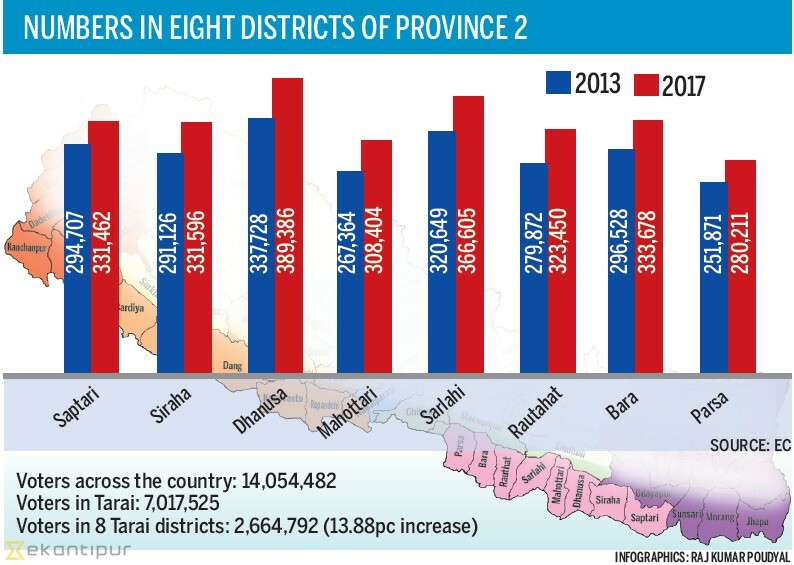 Amid claims by some Madhes-based parties that many voters of Tarai districts were left out when the Election Commission updated its voter list, data of the poll body show a growth in number of voters in the region. Number of voters in 20 Tarai districts has gone up in 2017 by 15.46 percent compared to that in 2013 when second Constituent Assembly elections were held, according to the EC which completed updating the voter list on Sunday. The growth in number of voters in Tarai districts is on par with the national growth average of 15.69 percent. According to the updated list of the EC, 14,054,482 citizens are eligible to cast their votes in local level elections scheduled for May 14. Of the total voters, 49.93 percent are from 20 Tarai districts. According to the EC, the total number of voters in Tarai districts has increased to 7.01 million. There were 6.07 million registered voters in 2013. The growth rate is a little lower in eight districts of Province 2, the stronghold of the agitating Madhes-based parties. According to the EC data, the number of voters in Saptari, Siraha, Dhanusa, Mahottarai, Sarlahi, Rautahat, Bara and Parsa of Province 2 has gone up by 13.88 percent to 2.6 million. Madhesi leaders have insisted that names of many eligible voters of Province 2 are missing. “A relative low growth rate in Province 2 is an indication that many voters are not on the voter list,” said Shivaji Yadav, chief whip of Sanghiya Samajbadi Forum-Nepal, one of the constituents of the Samyukta Loktantrik Madhesi Morcha, which has warned of disrupting polls in the Tarai region. Madhes-based parties are of the view that many voters did not register themselves as they were not expecting local elections [on May 14] given the current political situation and the ongoing agitation by the Madhes-based parties. “People who have not registered their names usually tend to rush to get themselves registered once elections are announced,” said Yadav. The EC, on the other hand, maintains that its list is thoroughly updated and argues that it had reached out to voters through mobile teams at the ward level of then village development committees and municipalities. “District administration offices, district election offices and area administration offices were mobilised to collect voter list,” said Election Commissioner Narendra Dahal. He said that the EC prepared the voter list without any obstruction in districts of Province 2. With the agitating Madhes-based parties demanding amendment to the certain provisions of the constitution for their participation in local level elections, they are calling for including the “left-out voters” into the voter list. Rajendra Mahato, chairperson of the Sadbhawana Party, said that as many voters have not been registered, they should be accommodated to ensure their franchise right. But new Act on Voter List says EC cannot register new voters from once election date is announced. Hence, the EC stopped registering voters from February 20—the day the government announced local elections. However, Mahato says “left-out voters can be accommodated” by postponing the elections.